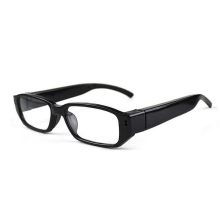 These mini camera eyeglasses are must equipment and highly recommended devices for journalist, travelers and etc. It can record your favorite scenery, some exciting performance, happy moments on a gathering, wedding and so on. Windproof, effectively protect your eyes. Recording the scenery along the way and captures the wonderful moments. Supports 1080P video resolution and supports 5MP picture resolution. Support max 32GB TF card memory(Not Included). USB 2.0 connection with PC, no driver needed. User friendly operation button for easy control. A must equipment and highly recommended device for journalist, travelers and etc. Power on: Press the "Power-on" button for 2 seconds, red light on and device enters into stand-by state. Photo: Short-time press the video button to take photos; red light is off and on again, indicates device saves the files. Long-time press the video button for about 2 seconds, red light is flashing 3 times, then off, it starts recording, Short-time press the video button in recording, blue light flashing means stop video recording. Power off: Long press power-off button for 3 seconds until red light flash 3 times. Low-voltage: Red and blue lights flash 3 times, then shut down automatically. Reset: Use slim pole to press Reset button. Charging: Red light will flash while in charging; fully charged, red light would be off, and blue light is on.